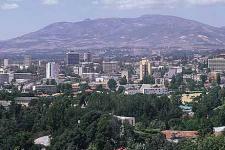 Up on arrival in Addis Ababa, you will be met by YTT representative and transferred to your hotel. Early morning drive to Arba Minch. Along the way you will visit the Tiya stellae field with its 600 years old stellae (a UNESCO world heritage site) and if open the Melka Konture archaeological site (Optional) near the Awash river. Here you can see hundreds of Stone Age tools, fossils and remains of animals and people. There is a small, interesting museum and you can visit also one of the sites where is shown how the field work is done. Late afternoon you will arrive in Arba Minch, where you can enjoy a lovely evening. After a nice breakfast you will be driving to the upper part of Arbaminch town ‘Secha’, where you will pick up the captain of the boat and your guide for the Nechsar NP, as Lake Chamo is part of the Nechsar National Park. You will start driving out of the town towards Lake Chamo. You will cross the lake where you will see different water birds, crocodiles and hippo’s. After crossing you will start walking uphill in order to reach the Nechsar planes where you can see the zebra’s grazing. 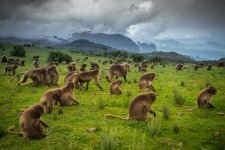 You will have a short walk, where you will see different animals that belong in the park and that are endemic to Ethiopia, like the Burchell Zebra’s and the Swayne’s Hartebeest. After lunch you will have an additional small walk across the plane and then will go back to the boat where you will cross the lake again, where there is some more time to see the crocodiles and hippo’, and enjoy the views. Renowned for their remarkable bee hive shaped huts entirely constructed from organic material, the Dorse are small omotic speaking ethnic group whose territory has a cold misty weather and year round moist climate. Visit a family compound of the Dorse people. The family can tell you about their life style and culture and the housewife shows you how their basic food is prepared from the stem of the enset tree. Konso, which is one of the South Omo tribes that are famous for their Agro-pastoral way of living. Their terracing systems in agriculture are protected under UNESCO cultural heritage. 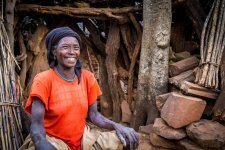 The Konso people are very friendly people with a clear understanding that the youth has the future, as they have a children’s parliament within the tradition of decision making in their tribe. We are working in Konso with the local guides, these are people from the Konso tribe that are trained in tourism and have the experience to show guests around and explain about their culture. Make a cultural trekking through the beautiful terraced hills of the Konso people. In different traditional villages you can see the potters, weavers and blacksmith at work and try these different handicrafts yourself. If you want to see many “Waka’s” (wooden grave monuments” you can visit the cultural museum as well. In the morning you can visit first the natural phenomena “New York: which are huge sand pillars carved out by erosion. Nearby “New York” you can visit the traditional village of the Konso King who lives there only with his own family. If he is at home it is interesting to speak with him because he knows very well English. At the end of the afternoon we will start our drive back to Arbaminch, where we will take a small detour through the mountains to visit the Derashe village. This tribe is known for their special dance and whistles. In the morning you will start driving after breakfast to Jinka. On the way you will pass by the village of Key Afer, which is the village of the Benna tribe. The Benna tribe is closely related to the Hamar tribe, there are some slight differences on the clothings and hairstyle. You will have lunch in Jinka, after this you will visit the Jinka museum and travel to the Ari tribe village, which is just outside Jinka. After breakfast you will visit the Jinka market. As Jinka is the capital of South Omo, most of the tribes will come to the main market in Jinka. After the visit we will start driving to Turmi. In Dimeka we will stop for a lunch and visit the small village. The Beshada tribe who is living here, are closely related to the Hamar people. In the afternoon you will arrive to Turmi. 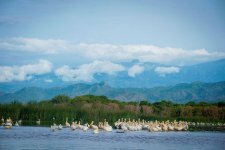 Today you make an excursion to Omorate which is found east of the Omo River the sole feeder of Lake Turkana and Lake Rudolf. In Omorate there is a daily market and it is interesting to make a walk in the small town or to sit for a while at the shores of Omo River where the local Dassanech people cross the river by traditional wooden canoe (cut out of 1 solid stem) or bring their cattle down to the river to drink. 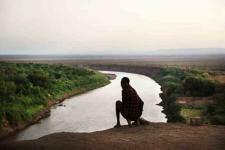 You can cross Omo River by the same canoe and walk to the nearby Dassenech tribal village. This village is very touristic. People, ornamented and painted, will ask you to make a picture of them (5 birr per photo) or buy their souvenirs. If you like to visit a non-touristic village, ask your local guide to walk further OR don’t cross the river and ask the driver to bring you by car to a remoter village for which you have to follow a sandy track (this may be difficult in the rain season which is April/May and October/November). Drive early morning appr. 2.5 h. through Mago National Park to the hot and dry area of Mursi people and spend some hours together with the Mursi people in Marege village to experience a little bit of their daily life. 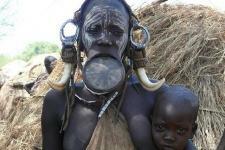 The Mursi people are known for their extravagant way of dressing up for pictures. Spending some time without camera is a better experience in this village. If there was not enough time on Monday, it is still possible to visit the Ari village or the Jinka museum today. There will be just enough time to do one of them or to just walk around and enjoy the different tribes that are present in Jinka. 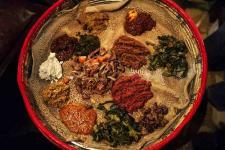 After this you will be transferred from the Lodge to the airport by the shuttle and fly back to Addis Ababa. In the morning you have a flight to Lalibela. After picking you up in the morning, you will have time to rest or explore Lalibela yourselve. Next morning you will visit the first group of the UNESCO churches. 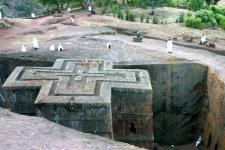 It consists of six churches including Bet Medhane Alem, the largest of all the Lalibela churches. Taking the form of a Greek temple, it is unusual in being entirely surrounded by the square- shaped columns, with a further forest of twenty-eight massive rectangular columns supporting the roof inside. A few minutes’ walk from Bet Medhane Alem is Bet Maryam dedicated to Mary, the mother of the Christ. It has a deep square pool in the courtyard is said to have miraculous properties, and infertile women dip themselves in the algae-covered waters at certain times of the year, particularly at Christmas. 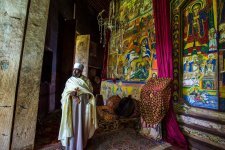 Other churches in this group are Bet Meskal, Bet Danaghel, and the inter-connected churches of Bet Golgotha and Bet Mika’el with the Sillasie Chapel and the Tomb of Adam, form the most mysterious complex in Lalibela. In the afternoon you will walk to southern group of churches. There are four churches including-Bet Amanuel the finest of the group, its elaborate exterior much praised by art historians. Bet Merkoriois, is thought to have originally served a secular purpose- perhaps that of a house of justice, as amongst the secular objects found in recently excavated trenches were shackles for the ankles of prisoners. Bet Abba Libanos, which is separated from the surrounding land on only three sides, is a structure of great charm, and a good example of a cave church. And the last but not the least is Bet Gabriel-Rufael. And last but not least visit the isolated but the remarkable church of Bet Giyorigs, possibly the most elegant of all the Lalibela structures. In the afternoon you can make a walk to a farmer house to visit and experience the life style of the local people. 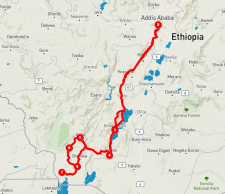 In the morning you will drive to Bahir Dar. Along the way you will visit the village of Awra Amba. Awra Amba is an Ethiopian intentional community of about 463 people. Founded by Zumra Nuru, who currently serves as co-chairman of the community, with 19 other people who shared his vision, as of 2016 Awra Amba has some 450 members, and is lauded as a model to alleviate poverty and promote gender equality. The fact that its members work together, are diligent, disciplined and self-confident makes the Awra Amba community distinct from other Amhara communities. Women have equal rights as men and there is no distinction in divisions of labor between men and women. 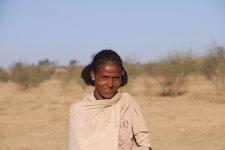 All people in the community have no religion as distinct from most communities in Ethiopia. They believe in hard work and being good to people. They keep their houses and their surrounding clean. In the morning you will drive 35Kms to Tis Isat (smoking of Fire) waterfall of the Blue Nile. This used to be one of the most spectacular falls in Africa. Since a dam has been built upstream, the waterfall is reduced but specially in- or just after rain time still impressive. Also the walk to the waterfall is nice and you can enjoy nature and watch birds. Keep an eye out for parrots, bee-eaters, lovebirds and turacos. You can see vervet monkeys as well. In the afternoon you will make a boat trip on Lake Tana Covering over 3500sq km which is Ethiopia’s largest lake and is famous as the home of the medival-19th century monasteries and churches, established on some 20 of its 37 islands. Most churches in the monasteries have interesting paintings and contain a collection of church treasures and beautiful old manuscripts. You visit the 16th century circular Ura Kidane Mihret Church on Zege Peninsula which is one of the most beautiful Churches of Tana region, the walls covered with 100 – 250 years old colourful mural paintings. It has also a museum with very old hand written holy books and bibles and other (church) treasures. 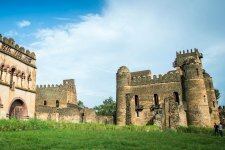 In Gondar visit the Royal Enclosure that is surrounded by high stone walls containing the ruins of 17th century palaces of king Fasiladas, king Iyasu and queen Mentewab and different other buildings such as a library and dining hall. The buildings are a mixture of Ethiopian, European and probably also Indian styles. According to descriptions of 17th century travellers, the interior of the castle of king Fasiladas was extremely luxurious, decorated with gold, ivory and precious stones. Hereafter visit Fasiladas’ Bath, which is built in the same style. It’s peaceful, shady and beautiful spot, and well worth a visit. The ancient bath is filled with water for the important Timket (ephany) ceremony once a year. The ceremony replicates Christ’s baptism in the Jordan River, and is seen as an important renewal of faith. And also visit Debre Birhan Sillasie Church meaning Trinity at the Mount of Light. It has rectangular structure and ceilings are decorated with beautiful winged angels and its walls with impressive scenes depicting biblical events, including the life of Christ, Mary, and the saints and martyrs. There is also a painting of the church’s founder, Emperor Iyasu I. Drive to Debark through scenic landscape, passing the wonderful viewpoint of Kosoye. Just after Gondar you can make a stop at the Falasha (Jewish) village Wolleka from where the last black Ethiopian Jews left in 1992 to Israel. Only an old synagogue reminds of the Jewish past and further the village is more like an open air souvenir shop. 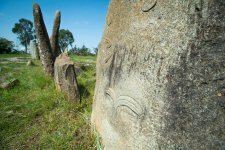 Axum is a town full of impressive monument that testifies of the rich and glorious past of the mighty Kingdom of Axum (1-700 A.D.). And the town also recorded in UNESCO lists as a World Heritage Site. Within this 2 days visit Axum’s famous app. 2000 years old stellae. They are striking for their huge size, their incredible pristine and sculpted from single pieces of granite to look like multi storied buildings of which the biggest is the Great stellae measuring a massive 33m. It is believed to be the largest single blocks of stone that humans have ever attempted to erect. This stellae has fallen down and lies broken in different pieces on the ground. The biggest still standing stellae measures 23 m.
complete hominid fossil remain of Lucy locally known as Dinknesh meaning wonderful. 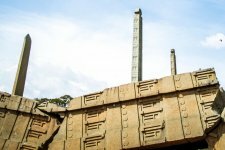 Visiting this museum means having a good summary for your visit to the historic Ethiopia. In the evening, enjoy a nice dinner after that, transfer to the airport for flight back home.